While most websites are (naturally) hosted online, there are plenty of situations in which you may want to create a local WordPress site. For example, you might need to set up a staging environment to develop your site before it goes live, require a safe place to experiment with designs, or perform troubleshooting. In any of those scenarios, all you’ll need is the right solution. When it comes to creating an offline WordPress site, Local by Flywheel is one of the most intuitive and powerful tools for the job. This solution makes it easy to install WordPress on your computer, clone your site, and even push your local version live. If you want people to visit your website, it will have to be hosted online. In fact, one of the first things you’ll typically do when setting up a new website is to sign up for a hosting plan. However, there are times when you’ll want to work on a ‘public-inaccessible’ website. A ‘local site,’ also known as a ‘development site,’ is a website stored on your own computer. This means no one is able to access it unless they’re logged into that specific device (and have the right credentials). Experimenting with and learning a new platform. Building a new site offline, so no one will see it in its half-finished state. Redesigning a live site, or otherwise making large-scale changes to it. Performing troubleshooting, to fix a hack, error, or other issue. Creating a site for a client, to keep it private but enable collaboration and feedback. What’s more, you can create a permanently private local site, or make a copy of a live site so you have a version you can play around with. Once you’re happy with the changes to your local site, you can even upload them back to your live site (I’ll talk more about this later on). Of course, to set up a local site you’ll need the right tool. There are lots of options available, including third-party solutions and applications offered by your hosting provider. Next up, let’s take a look at one of those tools. If you’re looking to create a local WordPress website, you can’t go wrong with Local by Flywheel. This fully-featured tool contains everything you’ll need to set up and use local sites. It’s simple enough for beginners to use, but also offers plenty of advanced features if you want to customize the way your local environment works. Best of all, Local by Flywheel is completely free to use (although there’s a premium version with even more functionality coming soon!). This means you can try it out without any risks or obligations involved. Let’s see how it works in action! Fortunately, setting up Local by Flywheel and using it to manage your local sites is a straightforward process. Over the next few sections, I’m going to walk through how to start using it. The process begins with installing the tool itself. This will install a few programs that are required for Local by Flywheel to work properly. The installation may take a few minutes to complete. If you receive any prompts during the process, make sure to hit Yes to permit the installer to do its job. There are several options to choose from. You can create a new site, which I’ll talk about next. You can also select the cloud icon to connect to Flywheel’s managed WordPress hosting services, enabling you to make copies of existing sites and push local sites live. Finally, in the top-left corner there’s an “Options” menu to let you configure various settings and preferences. However, this is optional – right now you’re ready to create your first local site! You may want to make this something descriptive, especially if you plan to create multiple local sites. You can always change the name of your site later on. Here you can set a domain and path for your local site, and choose whether to create it using a Blueprint. This last option is a handy time-saving Flywheel feature that lets you set up a site using a predetermined set of themes and plugins. The Preferred option works well for most beginner users, while Custom comes in handy for developers with more specific requirements. Just keep in mind that if you go with the Custom option, you won’t be able to connect your local site to Flywheel (in order to publish it live if you so choose). It may also require downloading some additional files. On this screen, you’ll create a WordPress username, a secure password, and an admin email address. Under Advanced Options, you can also specify if you’d like this installation to be a multisite setup. Then, hit the Add Site button. You can now select the Admin button to log into your site and get to work! In addition, you can always come back to this dashboard if you want to make changes to your local site’s setup or domain. Technically, the above two steps are all you need to set up and use a local WordPress website. However, if you’re building a site that will eventually go live on Flywheel, you’ll also need to know how the process works. You’ll just need to enter your username and password to make the connection. After, all of your local and live sites will be listed in your Local by Flywheel dashboard. From there, it’s a matter of a few clicks to push your local website live. Once your account is connected, you’ll have other options here as well. You can make a copy of a live site and turn it into a local site, for example. Then you can make changes, and copy them back over to the live version. With that, you know everything you’ll need to create and manage development sites through Local by Flywheel. How you use them is up to you! Being able to quickly create a local WordPress site offers numerous benefits. It lets you develop a new website in peace, and makes it easy to perform testing and troubleshooting without affecting your live site. Local by Flywheel enables you to do all of this easily, while offering plenty of advanced tools to enhance your local development options. Create your local WordPress site. Export your site to Flywheel when it’s ready to go. 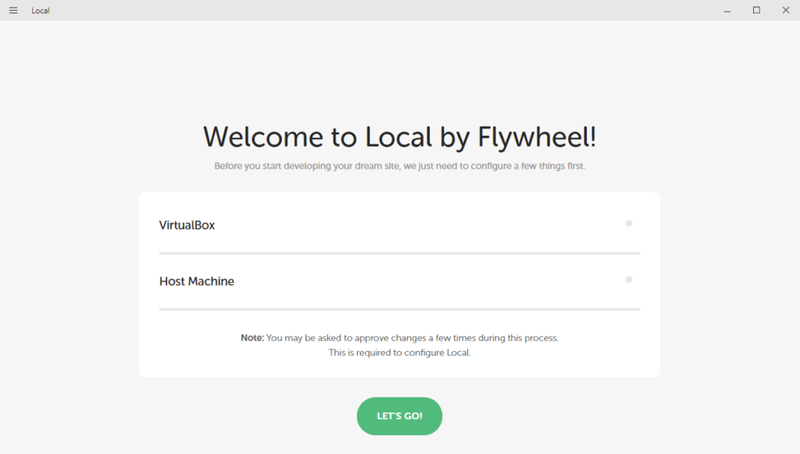 Do you have any questions about what you can do with Local by Flywheel? Let me know in the comments section below! Wow. To offer this--and for free? Terrific! Set up was a breeze. I used to use ServerPress, but this is super sweet and will be a vital part of my workflow. Thanks, Flywheel! You guys rock the casbah! Hi, This is very, very cool! Just wondering how it works to go from local to Flywheel hosting? Thanks!! For now, you can export a ZIP file of your local site and upload it to our free migration form to move a site onto Flywheel. We'll be releasing some super simple updates soon though, so be sure to sign up for updates! You guys rock! I'm also currently using ServerPress but my subscription ran out and I'm super excited to try this. Will you have a feature coming out for pulling in a live flywheel site to a local installation? Thanks so much for this—it looks amazing! I'll be giving it a try ASAP. Absolutely amazing! Speechless on how easy this app is to use. Thank you Flywheel! As soon as I read the news over at WP Tavern, I just had to try it out. As the others above have said already, it is super easy to spin up a new site and to access it via SSH and Adminer. I had never heard of Mailcatcher and I think it is great as is the usefulness of adding SSL and a live demo URL! Simply awesome that you offer this free of charge, thank you Flywheel! Tried downloading it and spinning up a site... resulting in: 'Error: WordPress installation failed'. Re-installed WordPress and now can't connect to the database, with Adminer, Sequel Pro or through the Wordpress config set-up. No docs, nothing back from support on the community forum. Hummm. Hey Fred, sorry about the trouble. Looks like a member of our team replied to your question in the community forum this morning. They'll be able to help you get to the bottom of this! Mac only, so I won't ever use your products. How do I generate a shareable URL? "Live Links: Show off your latest work! Create shareable URLs to demo your local WordPress sites to clients, collaborators, friends, or adoring fans." I hope to find documentation on that soon. I'm having troubles with my admin password - it's not a typo issue. Am I able to import a WP site created locally in say MAMP, into Local by Flywheel? I'm attempting to host our site locally, using the files downloaded from Flywheels Back-up download. After adding the site, local by flywheel is stuck at the 'installing WordPress'. Does this indicate the the backup does not include all the files I need to launch the site on local? Hey Noelle – sorry it's giving you some trouble! Sounds like you might've found a bug. If you head over to the Local Community, you can report this to the developers and follow along with updates. can I upload the ZIP.file as well to another hostservice or is only flywheel suporting these files? Hey Ro, they should work with any host! Your provider should be able to help you out with any specifics about the files. How can you share with multiple developers on a local network? Running isolated docker? I'm interested in using Flywheel to start developing locally when I go on travels that force me to be offline. I'm just wondering, how would the process to make the site live work. Do you have an article on that? Could I simple use the duplicator plugin? If you're looking to take the site live on Flywheel, you can simply export a ZIP file of your local site and upload it to our free migration form. Our support team can take it from there! This sounds like a great option. I am wanting to move my live site with duplicator down to a local version so I can test out some new changes. How would I do this with your software, is it easy to accomplish or is there documentation? I am not setting up a new local site, so the instructions here don't apply. When it was first released it did not have the option to export it as a zip file to other hosting providers. Has that changed or are there plans to allow a Flywheel Local site to be uploaded to other web hosts? need to know which server conditions i need to do an automated plugin update. What is needed on the serverside!? Plz lemme know. Look forward to hear from you ! Greetings Pls write back to [email protected] - thanks in advance! How can I setup my site without wordpress? Does the 'free migration tool' allow for uploading my .ZIP file to my existent servers? Also, this begs the initial question; 'Can I import the site I'm presently developing on my server into Flywheel Local? I'm already with a hosting service. "To export your local site, you’ll need a Flywheel hosting account." That line in inverted commas is quoted from the info above. I have an existing subscription to a hosting company. Do I need to cancel that before I even download this app and begin making the website with flywheel? Can I export websites developed locally using this tool to another hosting provider or is only useful for the Local by Flywheel environment?